There are many programs to install on your hosting account to help create or add to your website. These programs have many files and folders that are added to your file structure. Sometimes, you may want to rename files or folders. This may be for security reasons, such as renaming an administrative folder. They can also be used for debugging, by renaming folders or files to remove them from the program temporarily. In this cPanel tutorial, we will demonstrate how to rename files and folders from within the File Manager tool. Next, look for the Files category and click on the File Manager tool icon. Once inside the file manager, locate the file or folder you want to rename. If you are renaming a folder, be sure you have not entered that folder. Right-click on the item you want to rename and select the Rename option. Enter the file or folder's new name. Once you are satisfied with the new name, click on the Rename File button. 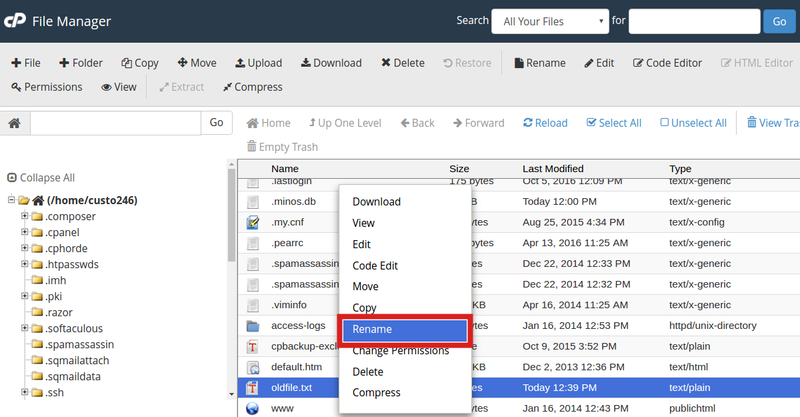 You will see the newly renamed file or folder within your cPanel file structure view. Congratulations, now you know how to rename a file in cPanel using the File Manager.